Am I the only one to use this page mostly? Yup. Do I care? Probably more than I’ll ever let on. Idea though: at the end of the year somehow poll for the best cards in here and display a few of them in a “display hall fancy” thing. , sacrifice equipped creature: ~ deals 2 damage to target creature or planeswalker. Grog looked at the goblin flying towards him and sighed. gurfafflekins I'll come over when I don't feel like doing any of the open challenges but still have an itch to scratch, so don't be a sad. Also, that poll sounds like a good idea. Might give people more incentive to post as well. The sheer amount of carddesigns collected from a year might be a bit too much though (though the rest of this year might not be). I really want to make a common, but I got a good idea that would absolutely not fit as a common, so too bad for me. Wording isn't very template-like, because I couldn't find something like it where the multiple tokens aren't all completely described (which would make for one ugly textbox in this case). Create three 1/1 black and green Insect creature tokens with " : Create a token that is a copy of this creature. Only use this ability if you control less than three Insects." The first of these tokens has deathtouch, the second has hexproof and the third has flying. melono : Three tokens with identical stats and colors but slightly different abilities seem like a bit of a nightmare to keep track of. Between that and the resilience, this certainly feels rare to me (and I'd probably consider ditching the "multiple different evergreens" thing even there). You're probably right in that it can get troublesome keeping it orderly. But the evergreen keywords were necessary to convey the evolution part. It represents the bottle-necking of survival traits. But still, chaos. I thought, if wurmcoil engine does it, I'll do it too. But I was not taking the token cloning into account. And looking at the cost and rarity of the card again, I'd probably make it a rare with at least an extra colorless mana necessary to pay. The card's a bit of a failure. 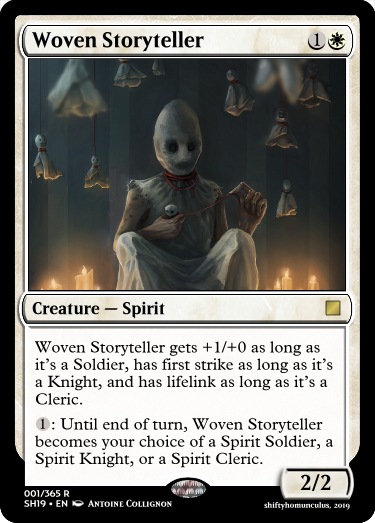 Also, I like that with your Woven Storyteller, you can change its typing and abilities mid-combat, giving it different buffs (possibly outside of the card itself) responding to its blockers (or its blocked creatures). Whenever a Swamp enters the battlefield under your control, create a token that is a copy of this creature. 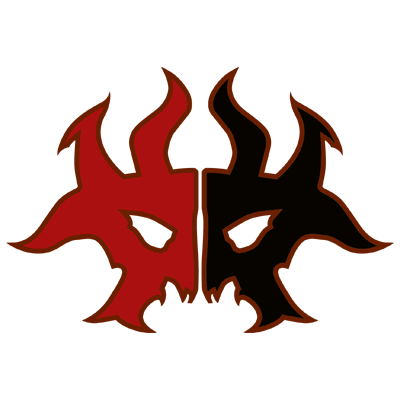 ~'s power and toughness are equal to the number of creatures called "~" you control. What one can do, many can do better. 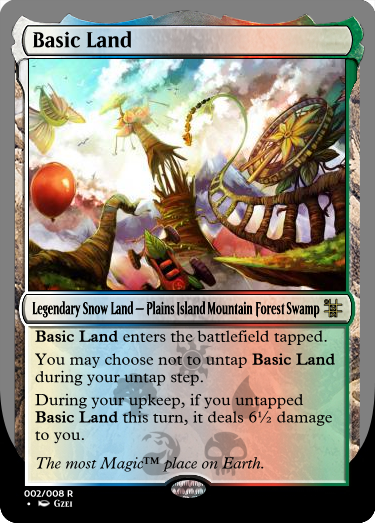 The natural design of bacteria (it's based on Thiovulum majus, a swampbased "crystalizing" bacterium) is unfortunately snowbally in nature, so it doesn't translate too well into a fun and balanced card. This card is a bit silly, but would probably actually see quite a bit of play in decks that have passive boosts readily available, or decks that need creatures to die real early. Okay, this creature's also a bit silly. 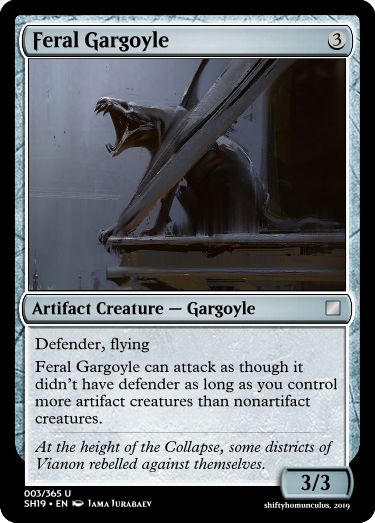 And an artifact creature. I can't help myself with this prompt. 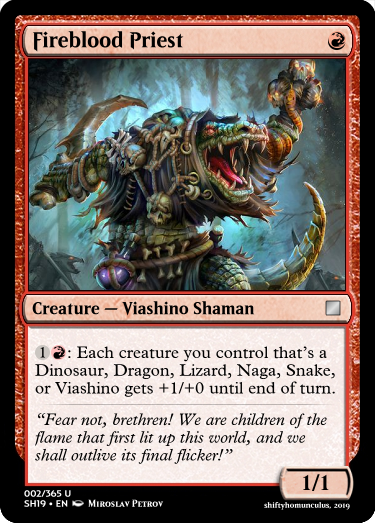 Design a creature with two or more creature types that have never been used on the same card before. Design a knight that's a race not yet knighted. Design a card with a brand-spanking new keyword. Design an angel that isn't . Continuum -- When Mother of Progress enters the battlefield, if was spent to cast Mother of Progress, it gains deathtouch. If was spent to cast Mother of Progress, it gains evolve. The Boros angels are fearsome, yes. And those in the Orzhov Syndicate are beautiful. But only the Simic's angels are perfect. Continuum is an ability word (that totally counts!) that gives a card different effects based on the exact colors of mana spent to cast it. You can either pay for the cost using multiple colors of mana since that's more accessible, or pay using just one color and gain a bonus. Here's a prompt: Design a Saga. Also, it turns out there has never been an Angel Knight. They've never printed one! Unreal. Design a Goat that doesn’t have Changeling. , Sacrifice an artifact: Put a +1/+1 counter on Can Chewer. The "legend rule" doesn't apply to artifacts. If it's perfect, don't fix it. Here's my suggestion for a prompt: "Design the most silver-bordered card you can." As an example, this is a card I originally designed for myself using that prompt. I've shared it before, but this is a version updated for my own semi-hypothetical Un-set / dumping ground for silly ideas, aptly named "Unfinished". Might as well base this off of one of the silliest cards I've ever seen. Laffeto, Icatian Broker enters the battlefield with X loyalty counters on it. You gain twice X life. I use this site on mobile a lot, so please forgive the occasional misspelling or two. Here's another prompt: Design a card using art from Peter Mohrbacher's Angelarium.